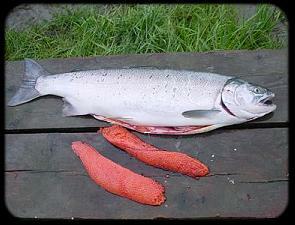 Eggs, or spawn ( roe ) sacs, have been long regarded as one of the best salmon and steelhead fishing baits. Below, you will find instructions for one of the finest eggs recipes around. Although we often use some of the commercial cures such as Pro-Glow, if we have the time to mix up this brine, we will! It makes some great fishing eggs, either clusters, or singles for spawn sacs. Over the past year we, along with several other area guides, have been using a new variation of an older egg curing method that has produced some of the best eggs that any of us have ever used. You've got some nice eggs, now what do you do?? 2 tablespoons of PRO-GLOW powdered red bait COLORING (not the cure). Be careful with this stuff, it readily stains anything it touches! Wear gloves when using the coloring or this brine, or else you have pink hands for a few days! First of all, split your egg skeins lengthwise and quarter them. It's easiest to cut down the portion of the skein without the membrane and lay the sac open. Next, with THE EXCEPTION of the eggs, bring ALL of the above ingredients to a boil in a large pan. Make sure to stir frequently!! After the mixture has been boiled and all contents are dissolved, cool the mixture to a luke-warm temperature and then place your eggs in the brine. Allow the eggs to soak for about twenty minutes, stirring about every 7 or 8 minutes. NOTE: for single, loose eggs, do no more than ten minutes in the brine, MAX! Then, remove the eggs from the mixture and drain in a strainer for several hours. Following this step, you will want to lay the strained eggs out on cotton towels for approximately 18-24 hours to dry. Once the eggs are relatively dry to the touch, roll them in plain borax and store in a plastic container. NOTE: for loose eggs, let dry for just a few hours ... or else they will turn out like a dried pea! You can keep them in the refrigerator for a month or so, if you plan on keeping them any longer than that, freeze in an air-tight container! Vacuum-packing works very well! Although somewhat time consuming, this process has produced the best eggs that we have every used ... we have used them in our summer king fishery in Alaska, and we have seen the same type of fantastic fishing qualities that we noticed in the Washington steelhead fishery. These eggs possess the same color qualities as pro-glowed, or pro-cured eggs, but they seem to milk much longer and are more rubbery, providing us with better bait durability. You might also experiment with adding shrimp or sardine oils to the brine mixture. We'll simply leave you with that subtle hint!